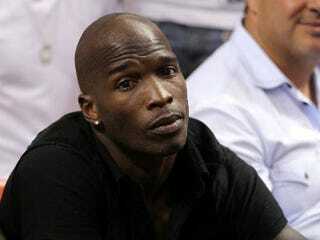 Chad Johnson and Evelyn Lozada started their relationship on Twitter, so maybe it's appropriate that the former Miami Dolphin, who was arrested earlier this month on suspicion of headbutting his wife, used the medium for a mea culpa related to the failure of his career and relationship. Rolling Out reports that he wouldn't even accept sympathy from a follower who felt sorry for him after discovering that his icon was missing from the Madden 2013 video game. Instead he tweeted, "Don't feel bad, my black a— messed up … " and publicly acknowedged having to come to terms with the need to re-create himself. "That awkward moment when you realize you're not on Madden13 and have to create yourself…," Johnson tweeted, awkwardly, referring to the iconic football game. And when one of his followers asked why he deleted his Twitter account, Johnson replied, "I got to start life over and create a new one … "
Shortly afterwards, another follower tweeted that she felt "sorry" for Johnson. But instead of feeling sorry for himself, the disgraced football player instead took full blame for the attack and the downfall of his marriage and career. "Don't feel bad, my black a— messed up, I made the bed now I gotta lay n it," he said.